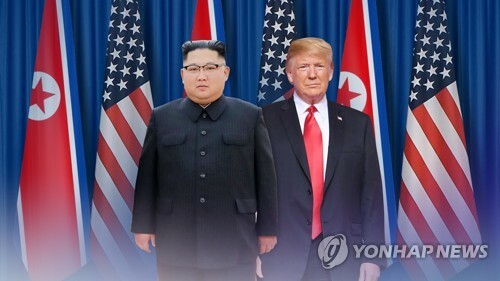 The two sides have been working to implement a deal reached by U.S. President Donald Trump and Kim to achieve “complete” denuclearization of the Korean Peninsula. North Korea is reportedly seeking sanctions relief in return. “President Trump has been very clear that sanctions relief will follow denuclearization, and the sooner we get to that point the sooner we can lift sanctions,” a State Department spokesperson said in response to a Yonhap query. According to a North Korean state media report Thursday, Kim lambasted the sanctions for standing in the way of the impoverished nation’s economic development. “The hostile forces are foolishly keen on vicious sanctions to stand in our way toward promotion of people’s wellbeing and development and to lead us to change and submission,” the Korean Central News Agency quoted him as saying during a trip to a construction site on the North’s east coast. “But they will be made to clearly see over time how our country that has built its strength hundreds of times defying hardship build its own country as a powerful nation by its own strength, technology and efforts,” he said, according to KCNA. The U.S. and North Korea have been in talks to arrange a second summit between Trump and Kim, possibly early next year. To discuss that and the details of North Korea’s denuclearization process, U.S. Secretary of State Mike Pompeo said earlier that he will speak to his North Korean counterpart next week. Diplomatic sources have told Yonhap Pompeo is expected to meet with Kim Yong-chol, a top aide to the North Korean leader, in New York around Nov. 9. “We remain committed to the final, fully verified denuclearization of the DPRK as agreed to by Chairman Kim,” the spokesperson said, referring to the North by its official name, the Democratic People’s Republic of Korea. Trump tweeted that he spoke with Chinese President Xi Jinping about trade and other issues. “Also had good discussion on North Korea!” he wrote. China, the North’s only major ally and trading partner, has recently called on the United Nations to consider easing sanctions on the regime. Xi is reportedly planning his first trip to Pyongyang in the near future.